Fair Dinkum perfectly formulated in Australia by the Vaping Bogan, who is a a self proclaimed "fruity d**khead" and wanted A fruity all day vape. A strong green apple on the inhale, subtle tones of white peach finishing off with a medley of berries. Manufactured in New Zealand, Created by the Vaping Bogan in Australia, Coorong Cola is a classic cola soft drink flavour mixed with a hard candy cola flavour creating a nice fizzy cola lolly pop that has a slight cooling finish. If its not a SIX pack its not the Ozzy way! "Ridgy Didge: (Australian slang) Means "the real article" genuine, not false or pretentious." - Urban Dictionary Bottled in New Zealand, Created in Australia by the Vaping Bogan, A sweet and moreish sugar cookie with hints of manderin. "The Ducks Nuts: To be the best in a category. 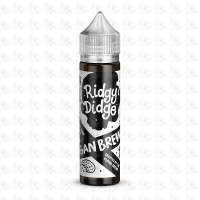 Similar to bee's knees, and dating from the same time period circa 1930s" - Urban DIctrionary Created by The Vaping Bogan in Australia, Made in New Zealand, get down and dirty with this Cherry jam doughnut. Formulated by the Vaping Bogan in Australia manufactured in New Zealand, Six N Out is a mass load of lychee flavours that packs a punch perfectly blended with a generous helping of Blackcurrants. "Bloody Ripper: (Australian Slang) Friggin Awesome, Totally Cool, Fully Sweet!. " - Urban Dictionary Bottled in New Zealand, Created in Australia by the Vaping Bogan, A Sour raspberry and pineapple flavour.